The spring shedding has started, so much horse hair coming out of my big boys. The muckiness has started, they have dirty hips and knees. Daily grooming has started and extra cleaning of feet is required. My boys have had the winter off. We have all enjoyed that down time, they like their cuddles and pats and rubs, I have enjoyed that leaning time, that just spending time with them, often huddled on the other side of the wind. However I have plans for my draft boys this spring here on the farm, not just riding which will be lovely but I need to put them to work in harness. Caleb is a old hand at hauling things around but this will be the first spring in training for Bojangles. Brandy’s gear fits him with a big of adjustments and Bo is smaller and easier to work in certain spaces then Caleb is with his bigger body. So that will be a fun learning curve to share with you as it goes. Last night was one of the first really nice days we have had and so when hubby said, want to go for a walk, I said yes and lets grab the horse’s and take them for a walk too. I had to laugh, when they saw us coming with halters, they lined up and helped put them on, they were as excited about getting out for a bit of time with us as we were to spend it with them. They would have been very much game for a bit of stretch the legs on the road, the only safe place to really walk at the moment, I was glad to be on the ground as they got a bit fresh. Its exciting to get out and be able to freely move after all their winter of careful steps on the snow/ice. Today we groomed and using horse cookies, we did some stretching.. time to start working with them daily for even just ten min or so weather allowing. I want to just run though the basic’s, do some stretching out, do some walking and then I will need to clean up the saddles and harness and start checking fits. The horse’s change shape from winter out of shape just hanging out, to working summer shape and it would be totally unfair of me to just grab them and ask them to work hard. They have lot of work coming in terms of giving me a helping on re-working the pastures, hauling wood, skidding out a few things and helping me use the ditch digger to create swall’s and a new rain garden this spring. Ferrier comes next week for their next foot trim. 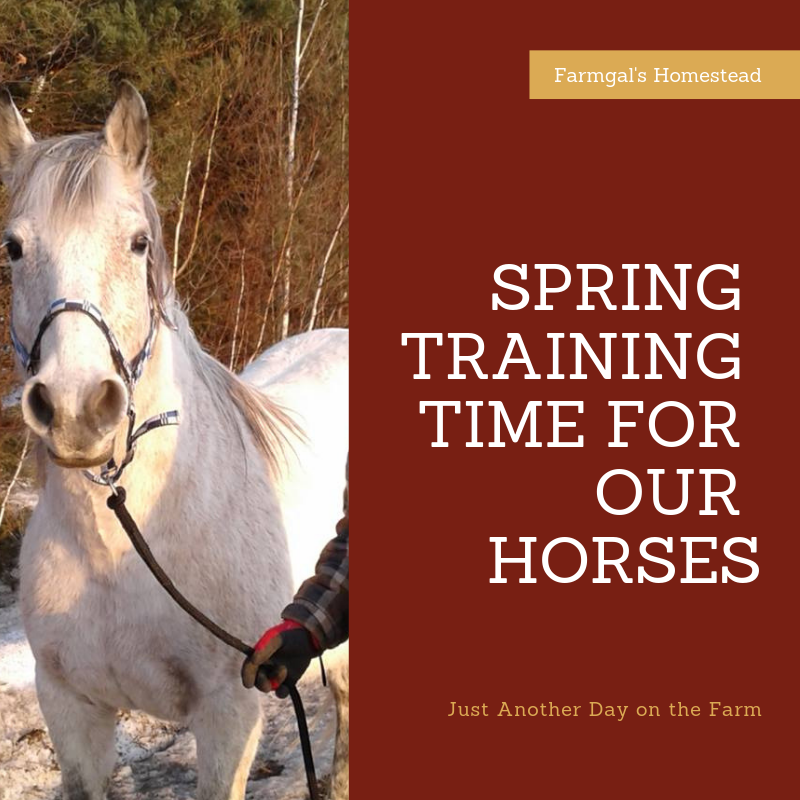 This entry was posted in draft horse and tagged draft power, Getting your horse back into shape, Grooming your spring horse, spring refersher horse's, spring work with your horse. Bookmark the permalink.